Passion fruit or Passiflora edible – climbing perennial plant native to South America belonging to the family strastotsveta. Grown for the sweet fruit is used for drinks and desserts. At home is to grow passion fruit at least in order to see its flowering. This plant is propagated by seeds and cuttings. - liquid fertilizer for tomatoes. For the cultivation of passion fruit is suitable even seeds taken from ripe fruit. Rinse them under running water and gently Pat dry. For sowing this plant is best suited for the middle of spring. Prepare the soil substrate. For the passion fruit suitable mixture of one part sand, one part humus and two parts sod land. Place moistened soil in pots with a diameter of eight centimeters. Seal the seeds in a soil not deeper than half a centimeter and place the pots on a well-lit windowsill. In each pot, plant two or three seeds. When the air temperature is in the range of twenty to twenty-five degrees, the seedlings germinate within a month. For the best germination, cover the pots with foil. When the young plants will appear at the four true leaves, transplant them into a container with a diameter of about forty centimeters in the ground of the same composition that was used for germination of seeds. Some growers are recommended to plant two seedlings together. Passion fruit should be placed so that the plant itself was well lit, and a pot of earth was in shadow. Protect plants from drafts and do not place it under an open window. 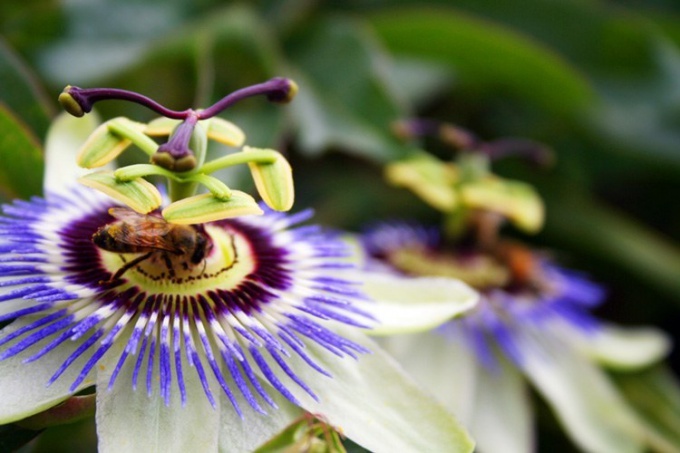 Like many climbing plants, passionfruit needs support. In this capacity, you can use a metal or plastic grid that is designed for climbing plants. If you are going to frequently move the pot from place to place, unable to pull rope to support the shoots. Secure the stems to the support. Pour passion fruit should be as dry soil. During active growth every ten days is recommended to feed the plant with liquid fertilizer for tomatoes. Passion fruit is grown from seeds will bear fruit the next year after planting. To get fruit, you should pollinate the plant manually with a brush. Recommended pollination in the first half of the day. Humidity should be no higher than seventy percent.